I was on my way to a holiday party at my former employers (had a wonderful time by the way!) and decided to check out a Habitat for Humanity Restore on my way there. The store was filled with lots of furniture, appliances and architectural elements, but they also had shelves of smaller bits and framed art. I discovered that things tended to be on the pricey side. I found some pretty German china and picked up the creamer to discover it was marked $50! And that was just for the creamer. All the pieces were marked individually. GASP! I carefully set it down. 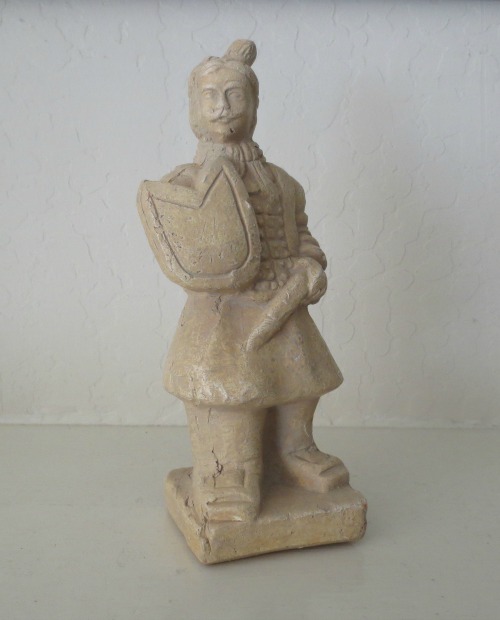 I did find a handmade clay Chinese warrior statue. He’s quirky and rustic, but also reasonably priced ($3.00) so I was willing to take a gamble on him. He’s marked © MANN on the bottom and later, at home, I found a horse for sale on eBay with the same mark for $49.99. Alas the seller doesn’t know anything about it. I also found a very small, charming numbered print of birds. Turns out it’s from Puerto Rico. Then I started looking at the framed art stacked against the wall. Actually most of it was not real art, just generic posters that get pumped out by the thousands. Nothing special. Hotel art. Ick! I did find a real painting of flowers for $65, but the colors were insipid (light pink and yellow) and in general, I find most flower paintings boring. Then down at the far end of the art wall, I saw this painting. Holy smokes! This was a real painting! And it had a cool mid-century vibe. I really liked it. It reminded me of the pier in the movie “The Birds” (one of my favorite movies) where Tippi Hedren climbs down to get into a dingy to deliver the lovebirds. 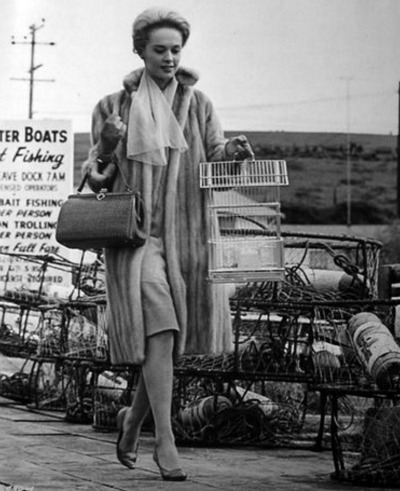 Couldn’t find a good picture of “The Birds” pier, but here’s one of Tippi on the pier. I was surprised that none of the other folks who had perused the art wall before me had grabbed it. I did a quick search on the artist in the store and realized this painting was definitely one to buy. But who was McCaine? This is one of the parts of thrifting that excites me..researching and learning about the stuff I find. After digging around here’s the skinny on McCaine. He lived in Palm Springs, CA, and painted contemporary pictures in the ’60s and ’70s. 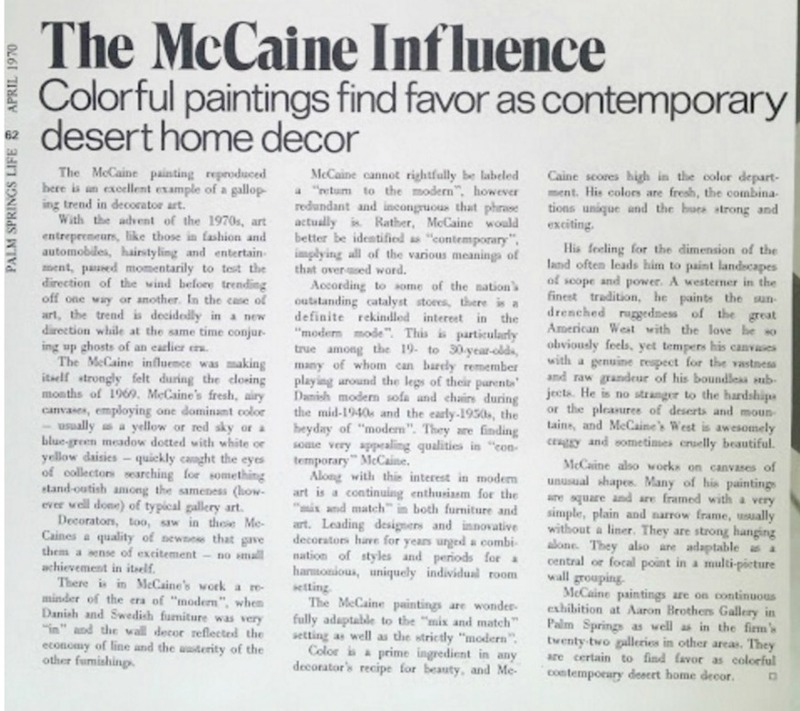 In this article from “Palm Springs Life,” we learn that “His colors are fresh, the combinations unique and the hues strong and exciting.” His paintings were on continuous showing at Aaron Brothers Gallery. I also researched sold prices for his art (they range from $50 – $1,200) and current asking prices on Etsy and eBay (they range from $199 – $695) which is helping me narrow in on my price. 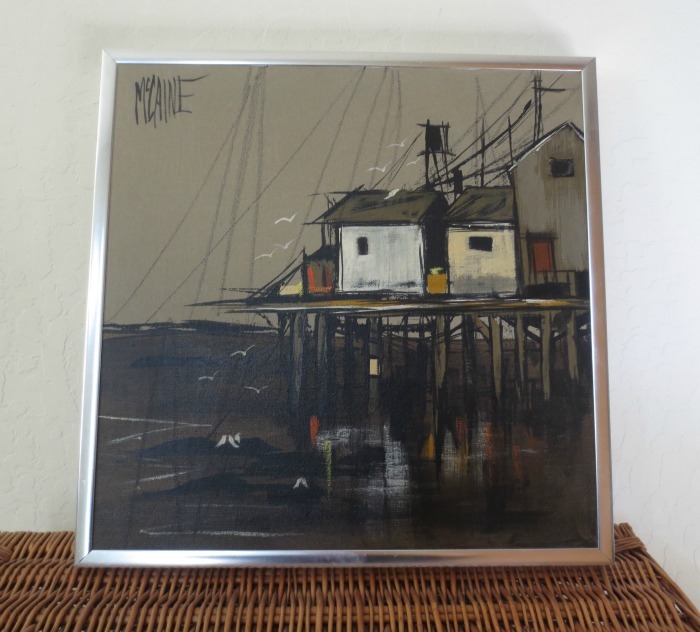 Paintings aren’t fast sellers, but I don’t mind if this one hangs around for a while. So I’m thinking the Habitat for Humanity Restore is a good one to add to my thrift store rotation! 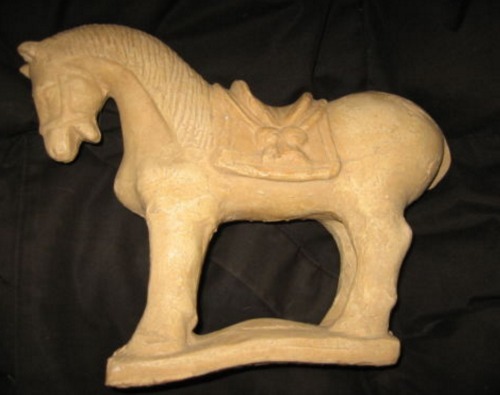 How about you…any good finds lately?? You are amazing, only a week til Christmas and you are off doing your ‘vintage’ thing!!!!! We drove to Vegas last weekend to pick up a laserdisc player and discs I found on Craigslist. (yes, you read that right). After leaving there, we saw a yard sale and had to stop. There are so few good yard sales here in Pahrump, we like to stop at them in Vegas when we can. I bought over 200 CD’s (my other passion) for $30. I just have to get motivated to list the unwanted laserdiscs on eBay.